I distinctly remember it was a damp night in the depths of November, when the wicked trickery transpired. The pulsating throb of my heart was piercing my every logical thought to despair as I fled in terror through the woods. Every panicking step cushioned by dead leaves that riddled the floor below, causing a faint crackling sound drowned out only by the screaming of the wind. What was I fleeing from? That was the worst part, I knew neither what nor why. The strange events prior to my fleeing were incomprehensible to me, I was not afraid of death, I was afraid of me. So let me start from the beginning, my name is Vincent, and three days prior to the aforementioned fleeing I had acquired a new residence. This new home was an old house, incredibly inexpensive despite it being fully furnished. It was a brick made detached house with heavy wooden doors, which must be worth a fortune alone I thought, a large dining room for entertaining guests constructed with a serving hatch leading through to the kitchen, a garden fit for king and a master bedroom fitted with an en-suite bathroom. How could a house so wonderfully majestic be so cheap? I thought suspiciously, but in a strange movement of thought I pondered no further. Purchasing the house could not have been easier and later when I returned to what was now my new residence I quickly noticed a strange puppet doll that I must have overlooked before. It looked distinctively dark, helpless and gothic. A misfit to the time she was lost within. She wore an ankle length dress and flower patterned hair but feminine was not the characteristic she emanated. Inscribed on the underside of the left foot was the name Elisabeth, clearly christened after production. She was cold to the touch, but it was her eyes that disturbed me. Staring intensely like a deviously scheming demon ever watching my every move. 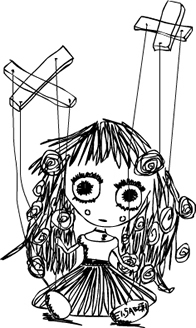 Yet, I was puzzled as to why this innocent gloomy looking puppet doll could emit such an evil impression. Why by its very presence I felt myself wicked. I felt an unnerving trepidation by the very thought of discarding this puppet. The apprehension was almost an addiction. I’d occasionally stop momentarily merely to gaze at this extraordinary thing as it captivated my every thought. Observing the said puppet’s observation of me with a scratch of a taste of a thought in mind, is it living? As it persistently consistently unremittingly assiduously watches me? “Stop it!” I’d shout frantically in its general direction pointing, only to witness its surveillance surge immensely. Is it the puppet or my paranoia? I began to question. It appears to mock me, play me like a fool, like I am the puppet! On the third day I had finally finished unpacking when an assertive knocking came of my front door, so I preceded in the custom of answering this attention seeking racket by opening the said door, with the latch on of cause, and stood before me was an elderly lady dressed in what looked like a green flower patterned curtain. “Err, I’ve come to welcome you to Bagworth” said with a scared fake half smile and randomly adding a short nervously emitted giggle. “I live just down the road” this feeble old lady then went on to encumbrance me further. “Err, may I come in?” disguised as a question, but clearly more of a warning to her following assumption of a hospitable welcome. Neither I nor the door was going to obstruct her as she hustled her way in. She then navigated in precision like she inhabited the residence herself and then in an annoyingly positive conjecture asked in a request “any chance of a cuppa?” As the kettle boiled I envisioned myself catapulting the boiling water over her and by that thought I clenched the handle of the kettle towards the counter top restraining the temptation and released my grip in fear. What is wrong with me? I thought in alarm. She then continued to irritate. “It is a lovely decorated house, I had a carpet like that once” she spoke as she pointed to the rich maroon red carpet. The worst part was I knew she was about to continue this verbal torture with a dreary story that probably never happened about a stupid carpet she once owned that was red. At that instant, madness befell me as all the hatred compressed within me burst out in a flamboyant display of discomfort, and as I once again grasped the handle of the black kettle, I swung with almighty aggression towards her head. With a single blow she was down, but still I hammered into her skull, pounding over and over again! An ecstasy had taken hold, the brutal homicidal thrill, concluding her pitiful life was like giving me a new verve, and I felt revitalised. Suddenly a desolate ambiance fell upon me as the shadows infected the room, devouring the retreating light mercilessly. I stood alone half clenching the kettle handle languidly, as the room began to cool like a breeze had just swiftly travelled by. Which felt disturbing at first but then comforting to the palms of my hands, that had now began to sweat uncontrollably. What had I done? I pondered. What evil act had I voluntary committed? I had never killed a person before and not once had the idea entered my mind. “It’s the puppet” I said with the right hand side of my upper lip raised in disgust. It must be cursed like some voodoo doll, I reflected in defence of my actions. “It has tricked me!” I thought out loud. “It’s laughing at me; I can almost hear its devious giggle!” I raised my voice in anger “Its making a mockery of me, toying with my very sanity!” Suddenly came an echoing tapping at my front door and I approached with apathy and precaution, slowly opening to see what devil the puppet had now sent me. “Err, I’ve come to welcome you to Bagworth” came a familiar voice. It was her! the same exasperating woman wearing the same tasteless green flower patterned curtain as the nauseatingly lifeless fat corpse that was currently on my kitchen floor. “Who the hell are you?” I shouted commandingly. “I am Elisabeth, I live just down the road” she replied obligingly. At this point I quickly slammed the door shut and ran for the back door to escape this demon lady, ironically tripping over the fat corpse on the kitchen floor. I threw myself up and fled out the exiting door and down the garden. I jumped the white picket fence and continued down into the nearby woods. “Why am I fleeing, what am I fleeing from?” I thought shortly. “Fleeing from my own madness, or fleeing from that puppeteering puppet?” My mind squandered, as a thousand gathered thoughts proliferated and severed my senses into divorce. The body relinquished its desire to survive, yet the hairs of my back erected like that of a cat in defence. The trees then darkened and enveloped me, enclosing me within its hold. What madness has befallen me? I thought frowning at the insanity of present. A procession of voices began to surround me, screaming in a symphony of prayers. “Vos evinco vos, Vos evinco vos” repeated over and over again. Then an epiphany dawned, my previous haste towards the aforementioned puppet had been foolish, ‘Elisabeth’ read the puppet’s carved label and yet this name so was too the identity of the dead corpse currently littering my kitchen floor. This madness was neither coincidence nor the paranoia it fed of; this was a predetermined fate designed by a puppet, it had mercilessly manipulated my every move since I had penetrated that godforsaken dwelling. I’d like to direct this reminiscence to a happier conclusion unfortunately this was the conversion’s terminus. You see, as I stood astonished by the previous epiphany, a strange buzzing sound filled my ears and drowned out the screaming prayers. As I tried to discover the cause of this monotonous noise, it intensified louder and louder! My senses sensitivity surged acutely as if knowing of its pending demise, and as my mind became distant, the very sensations I was subjected to mitigated my consciousness valueless. Louder, louder the buzzing persisted! I became motionless, and soon every sense in my body was obsolete. I found myself peaceful within my home. However I neither could move nor speak and I appeared to be precisely in the position once held by that wicked voodoo puppet. It was then that I discovered the true horror of the situation; what the foul evil witchcraft heartlessly banished me to for all of eternity. I see now what iniquitous torment had befallen me. I am no longer cursed by that scrutinizing puppet, I am the puppet, and like a puppet, I was played. Elisabeth was a short story I wrote and was published in Firstedition magazine’s October edition. They also kindly agreed to publish the ink drawing I had drawn as a cover for the said story.